This is a strange coincidence. I was straightening up the genkan, and collecting some old newspapers to stack in a special bag to use for bird cage liners. I used to subscribe to a paper newspaper. I stopped subscribing shortly after the big earthquake in 2011 when I realized I was just getting day old news and it was easier to read on my iPad. Anyway, I came across this one. Note the date. I guess things haven’t changed much. I’m definitely bringing this story up in the Hibiki no Kai English class on Sunday! PORTLAND, Ore. – Police in Oregon were told there was a chicken — and it was attempting to cross the road. In fact, the citizen who called the Portland Police Department non-emergency line on Monday evening reported that the chicken’s efforts to cross a road in a north Portland neighborhood were bringing traffic nearly to a standstill. He assured the dispatcher he was not joking. The dispatcher chuckled — and asked a clarifying question. Sgt. Pete Simpson says responding officers were unable to locate the chicken. I may be biased, but I would have switched the order of the top two. 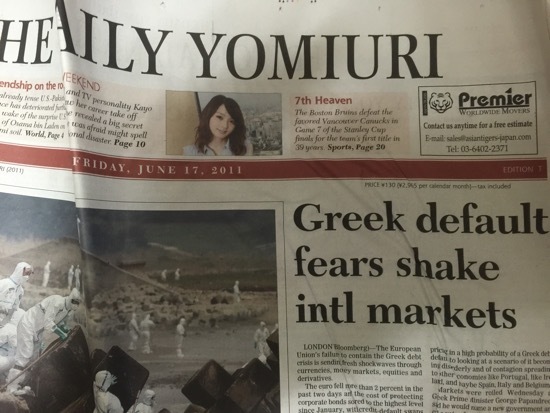 Japan’s disaster was literally earth-shaking. Bin Laden’s death was certainly important, but it was largely symbolic at this point.